Hope everyone has a great Fourth! The weather is beautiful and we are heading off to the big parade in downtown Apex. The kids decorate their bikes, wagons, baby strollers, and march down main street waving flags and cheering! At the end of the parade, the fire station has a firetruck set up to spray water on the kids so they can cool off. Should be a lot of fun. 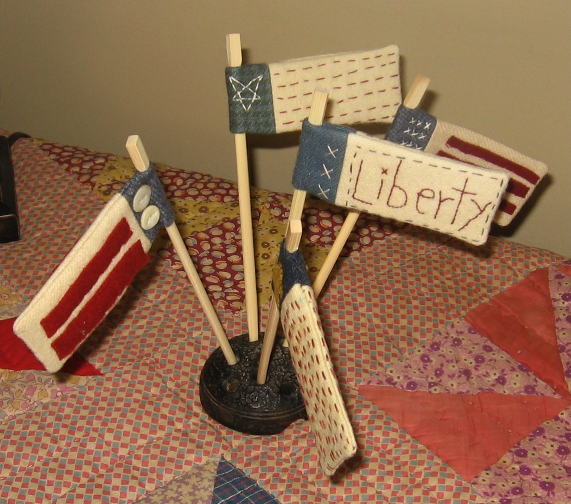 There are some fun little wool flags made from a pattern by Debbie Busby 0f Wooden Spool Designs. A vintage flower frog holds the flags quite nicely. The sticks will be painted black and maybe a bow will be tied around some of the sticks. I thought this would be a fairly quick project, but there is a lot of hand stitching involved, so it took a few hours to complete all 5. They are small enough to carry around in your purse if you want to work on something for a few minutes while you are waiting. This entry was posted in Embroidery, Holidays, Wool. Bookmark the permalink. Looking good. These would make great gifts also. Have fun at the parade ! The parade was great. Jack always enjoys it!